Somehow, I’ve taken to playing too many games at the same time. It somewhat impedes actually getting through them. Bioshock Infinite, although reportedly short compared to the previous games in the series, is taking me awhile to get through given that I keep getting distracted. There was also a problem for awhile where I kept having to do the same segment over and over again because my XBOX was resetting the date to 2005 so it would not load the resent saves when I started up again. Finally figured that one out. Kerbal Space Program. Yes it’s still in alpha, but it is an incredible game. Don’t Starve is a great indy game that I highly recommend. I randomly started playing World of Tanks this week and am quite enjoying it. However, it may be the sort of game that I get sick of quickly. We’ll see. I started playing the Walking Dead adventure game earlier this year, but only got around halfway through the first episode before getting distracted. I should go back to it. 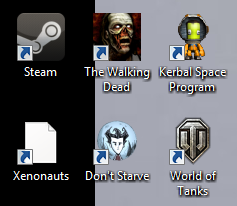 I have a stack of Steam games that I’ve picked up over the past year that I haven’t even touched. Witcher 2, Fallout: NV, Just Cause 2. Then there’s Xenonauts, the spiritual successor to the original X-COM, that I Kickstartered and alpha tested. It came out earlier this year. I haven’t even touched the release yet. I think I have a distraction problem.